The Agents of the New Order of Highsec are widely respected--not for one thing, but for a lot of things. Among the most prominent of our Agents' noble qualities is their basic human decency; their unfailing generosity and courtesy are undeniably impressive. Another thing that makes people respect our Agents is that they're really good at ganking freighters. Jupiter Boro was caught red-handed with an unlicensed freighter. You might assume that Jupiter was autopiloting through Uedama or something, but that can't be it: She was at her keyboard typing away. Despite being at her computer, Jupiter was engaged in an act of extreme bot-aspirancy. What was it? Well, the title of the post should give it away. 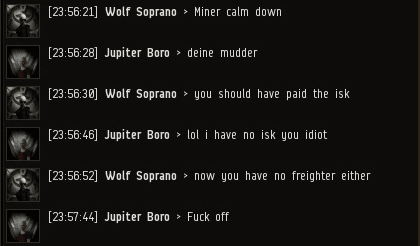 When an F-bomb gets dropped, you know a killmail can't be far behind. Yes, Jupiter Boro had just been successfully ganked. Incredibly, she was using her freighter as a glorified cargo container for some miners in an asteroid belt. In a 0.5 security system, no less. A small, elite unit of gankers took her down. 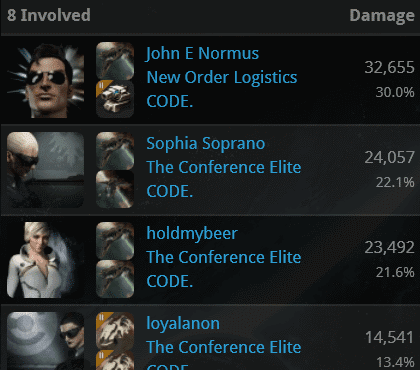 Take a look at the damage output from Agent John E Normus' Talos. In a regular suicide gank, it doesn't get much better than dishing out 32,655 damage points. After all the trouble CCP went to in order to give miners extra space for ore in their mining ships! Jupiter's freighter was triple cargo expanded. 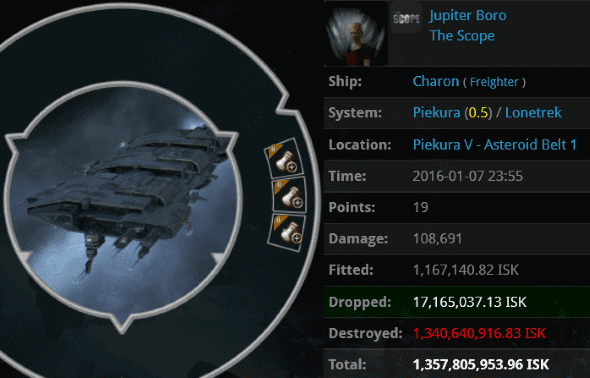 She managed to collect about 9 million isk worth of Plagioclase before the New Order took her 1.3 billion isk freighter down. Was it worth it? Despite previously owning a freighter, Jupiter claimed that she had absolutely no isk with which to pay the ransom. Carebears always say this, but they usually say it before they get killed for nonpayment. But Jupiter Boro was too deep in denial to admit her mistake. 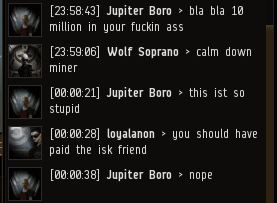 Buying a 10 million isk mining permit or losing a 1.3 billion isk ship? You'd think this was a difficult math problem considering how many carebears come up with the wrong answer. That having been said, the best time to buy a permit is before a New Order gank fleet is en route. In fact, if you're reading this and you don't own a permit, I'd strongly recommend buying one right now. Otherwise, it's like trying to buy fire insurance when the flames are closing in on your home. Typically, gankers require a little extra to compensate them for their time. In any event, I think we can all agree that using a freighter as a cargo container in an asteroid belt is a bad idea. You know, there are a lot of bad ideas in EVE. That's the nature of the sandbox; there are so many ways for you to make a mistake. The good news is, there's one very good idea in EVE, and the New Order isn't keeping it a secret. I blame antiganking for failing incredibly hard daily and non-stop! Win just in time for the weekend. This never ceases to amaze me. Like this guy who lost certain Mackinaw in Gamis. I convo him and politely told him he needs a permit. He refused and used racial slurs and common insults against me. He promptly got his Mackinaw ganked. Can't say I did not warn him and gave him a chance! 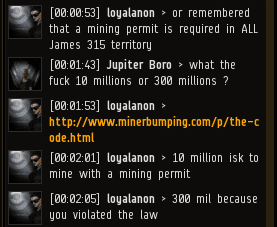 I already won at EVE, but i had a thought, would a permit be valid if an agent sold a permit to himself for his hauler alt? If hes following the code he has no reason to get ganked. Another one - The Ganked and the furious! Have you ever listened to a hisec miner for a while and wondered.... "who ties your shoelaces for you?" Jeezus fukin carebears. we can explain it to you, but we cannot understand it for you. If the miner pay one band of pirates off, they just wonder why a few lines on their bio won't protect them against another band of pirates. Because paying CODE anything is a suckers game.